The 4th graders had a great time gathering information, working with others, and presenting their research! Kristin and Brooke taught us about Bats! 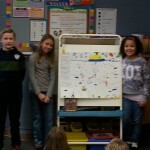 Anna, Bella, and Luke taughts us about Dolphins! Erica, Hope, and Melea taught us about Gorillas! Braeden, Elise, David, and Macey taught us about Kangaroos! Trinity and Simon taught us about Manatees! Jake, Hermione, Kailey, and Kendall taught us about Sharks! Joslynn, Rachel, and Aiden taught us about Tigers! Emilee and Allie taught us about Whales! Ethan, Kort, and Michael taught us about Wolves! Happy Valentine’s Day from our class!